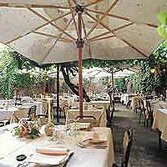 There’s no doubt that the food could be more distinguished, but Romolo nonetheless boasts one of Rome’s loveliest (and most romantic) spring and summer dinner gardens. Rafaello hung out here. Typical Città Eterna fare (mozzarella alla Milanese, fettucine, saltimbocca, lombatina, orate, rombo) takes on a new dimension when you eating it in the quiet, 25-table garden in the heart of ancient Trastevere. But it’s pricey. And in summer the mosquitoes can decide they want you as much as you want your meal.